The East Indiaman Götheborg is a living ship brimming with history to be told. Since the construction of the ship, we have rediscovered knowledge and expertise on how an 18th century ship is built, sailed, and maintained. As a volunteer you get the chance in taking part of this knowledge and learn craftsmanship on board. What is required for keeping an 18th century ship in good shape? What materials were used at that time, and what is used today? How is lashing conducted? 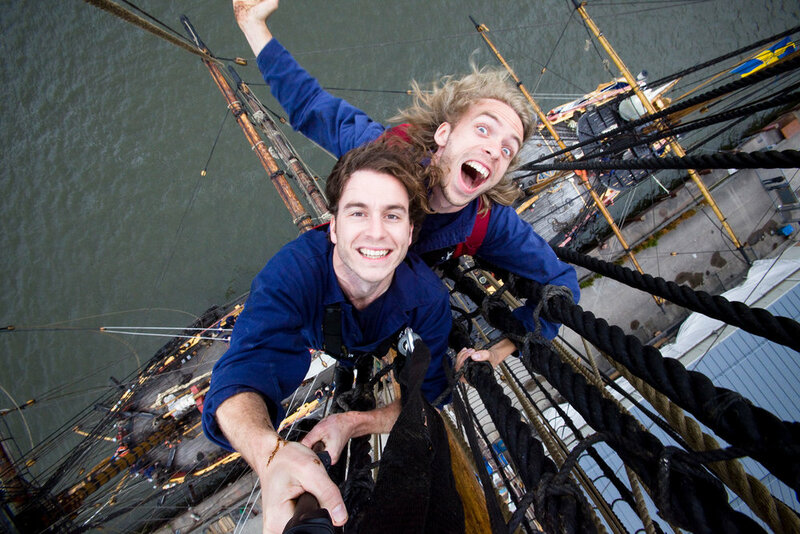 The tasks are varied and can revolve around anything from taring ropes, scraping the Hull, to working in the Rigging. Volunteers are essential for the maintenance of the ship and keeping it in shape. Being a volunteer on board is an excellent way of getting to know the ship and learning from others who have worked on the ship for many years. Volunteers are received every workday, with some exceptions. The practical work gives you a hands-on experience in a delightful kinship together with our personal and other volunteers. If you are interested to join as a volunteer, let us know at least one week in advance so we have time for planning. You are welcome as a volunteer regardless of previous experience. Everyone is welcome, we’ll teach you everything you need to know! In addition to regular volunteer work, we organize work weekends and work weeks that will be announced in the calendar here at our website and on our Facebook page. During a working week, more education is included than during regular volunteer work. In addition to rig training, you get to practice how to work with ropes and tie knots every day. Every day there is also a lecture or practical training, where you will learn more in-depth knowledge of a subject concerning maintenance or craft on board. If the weather permits, we launch the ships boats and row or sail with them one of the days. Usually there is a theme on the work week, a special area on the ship that needs extra maintenance at the moment. For those traveling to Gothenburg to attend our working week there is the possibility of sleeping on board the ship. We offer lunch for free every day and work clothes can be borrowed. The working hours are Monday to Friday, from 08:30 to 16:30. Since everyone isn´t able to attend weekdays, we sometimes organize working weekends. During the working weekends we work Saturday 08-16 and Sunday 08-15, there is the possibility of sleeping on board the ship and we offer meals for free. Working clothes will be provided, except for shoes! Bring your own rugged/durable shoes, preferable working shoes. It is possible to sleep aboard Götheborg. Please notify us upon arrival. Bring your own bedsheets; sleeping bag/duvets, pillow case, and bedlinen. Blankets and pillows are provided.